Fortnite’s latest patch brings a new limited-time mode, Food Fight, in which two teams defend one of the game’s restaurant mascots while destroying the opposing team’s. It’s chaotic, but it provides plenty of opportunities for backstabbing fun. 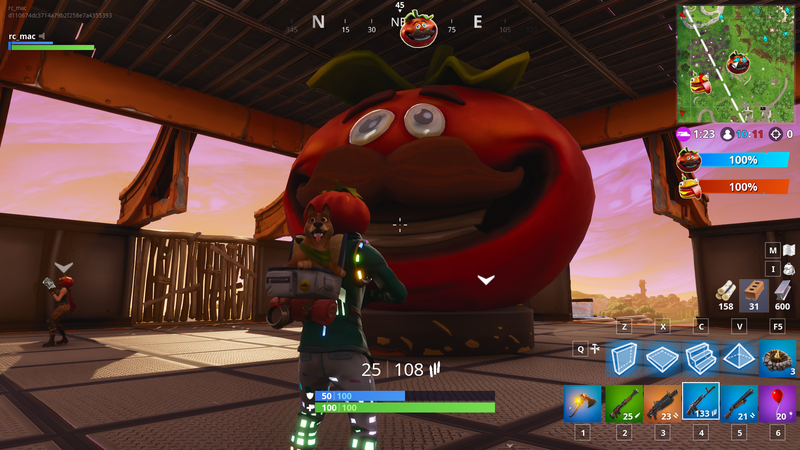 In Food Fight, released today as part of patch 6.30, teams are assigned to protect either the tomato mascot of Pizza Pit or the burger mascot of Durr Burger, two in-game restaurants. Teams can build protective structures around their mascot and arm them with Fortnite’s new mounted turrets before a barrier comes down, after which they can start destroying the other team’s defenses. Player have to destroy the other team’s mascot before theirs is destroyed. It took me a little while to wrap my head around the push and pull of reinforcing my team’s structures while moving forward to deal damage. Explosive items aren’t available, so you have to get in close. Death is not permanent in this mode. Players respawn with their inventory. Downed players also leave behind some ammo and materials, letting survivors keep moving through the match. Once I got the hang of things, I discovered what I consider to be the best strategy: jumping into the opposing team’s turrets and laying waste before they noticed me. As a battle royale game, Fortnite doesn’t provide a lot of opportunities for sneaky sabotage. I found that the chaos of Food Fight, with walls going up and people zipping around, was just distracting enough to sneak in unawares. From there, I could shotgun people before they realized I was their enemy. I could also leap into a turret and fire away before they realized and shot me, or—more often—the turret overheated and exploded, killing me in the process. I also had a good time headshotting distracted turreters and just generally taking advantage of the pace of the mode. Things are frantic in the midst of a firefight or when you’re up close with the opposing team, but the battle itself feels drawn out. In the games I played, our teams were mostly tied for damage until the late game, when panic encouraged riskier pushes and more aggressive play. Mounted turrets can now be found in the main game as well, and I’m excited (and a little terrified) to see what players do with them. Other players are also torn about the removal. “[F]or some people glider redeploy was what the game needed to be less stale,” one player said on reddit, and another agreed that it “made the games much more fun for me.” Other players felt it made the game less tactical or disliked how it de-emphasized building. I’m glad it’s still available in some modes, especially Food Fight, but we’ll see how players adapt to its removal. You can view all the patch notes here for more of the nitty-gritty. I enjoyed my time with Food Fight, and I’m excited to have more opportunities to infiltrate enemy teams.